Mutual funds vs. Exchange Traded Fund (ETF) vs. stocks vs. bonds – which one? How much of each? In what accounts? Are there tax implications? How long should I hold my investments? Will I even meet my goals? What are the start-up costs to invest? What are the ongoing costs to invest? Where can I get advice? Can I even trust this advice? Should I focus on my Tax Free Savings Account (TFSA)? What about my Registered Retirement Savings Plan (RRSP)? What about my kids’ Registered Education Savings Plan (RESP)? Is my money safe? What happens if this company goes under? Will I be protected? Are you suggesting I should know the MERs on my ETFs inside my RRSP before or after I consider asset allocation or asset location? All is not lost friends. You don’t need to be an investing guru to build wealth. With a robo advisor, your investment portfolio can be managed robotically or should I say far more automated and easily than it ever used to be. I believe with some help – you can get wealthy eventually. I personally believe the rise-of-the-machines is a great revolution in personal finance and investing – robo advisors can help retail clients automate their investing decisions so our bad financial behaviour and impulses don’t get in the way of wealth building. In going this route, we can also save money; this type of automation has created efficiencies for you and me and many financial firms. Efficiencies for big companies are fine but lower investing costs for you and I are even better! To help back-up-the-truck for readers who are new to investing, just striving to learn what robo advisors can do to improve their balance sheet, I sat down with one of the proud partners of my site – Navid Boostani, CEO of ModernAdvisor, one of Canada’s leading robo advisor firms. Navid, welcome back to the site. Always great to chat. Navid, I think the term robo advisor is misleading. There are real humans who want to help real clients behind all this automation. How would you demystify the term “robo advisor” and explain ModernAdvisor’s mandate? I would agree that the term “robo-advisor” is misleading, at ModernAdvisor we prefer “online investment advisor.” Unfortunately, “robo-advisor” has stuck. When you open an account on our website, your application is reviewed by a human before it is approved. A human reviews and approves all trades in client accounts before they are actually executed, and the trades themselves are executed by a human. Plus, all the algorithms that determine the appropriate asset mix for you based on your goals and constraints are designed by licensed investment professionals. Robo-advisor really means that you don’t have to interact with a human, unless there is an issue or you have a question. That just isn’t an option in the traditional advisor model. Who is your client base? Is this service just for rookies? The average age of our clients is 40, but we have clients as young as 19 and even some in their 80s. 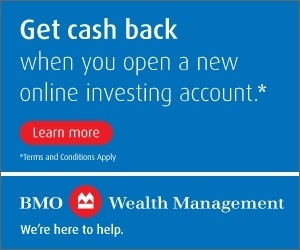 We have clients that have never invested in anything other than a savings account or GIC right up to those that traded stocks in their own accounts. We get most of our business from people who used to invest in mutual funds, but are now looking for a lower cost and more transparent alternative. What exactly does your team do? Our team at ModernAdvisor has two distinct groups, our development team and our financial team. 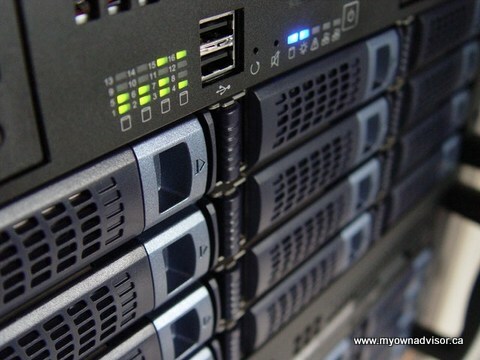 The development team builds and maintains our website, mobile apps, and automated processes. Our financial team develops the asset allocation and rebalancing framework, selects the ETFs, manages our client accounts, and answers client questions. How big does my portfolio need to be to invest? Our minimum account balance before we will invest it is $1000, but you can make regular deposits until your account gets there. What kind of investments do you use? Why? We use only high-quality, low-cost exchange traded funds in client accounts. 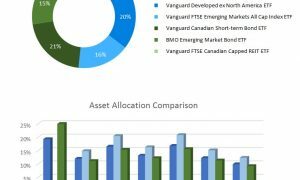 ETFs are the easiest way to achieve broad diversification across an asset class at the lowest cost. You can’t always control the returns on your investments, but you can control your costs, and costs are a big factor in your success as an investor. A fee of 2% doesn’t sound like much, but over 25 years it can mean missing out on tens or hundreds of thousands of dollars of retirement funds or having to delay your retirement beyond your desired retirement date. Clients with less than $10,000 with ModernAdvisor don’t pay any management fees (partnership). Up to $100,000 is 0.5% per year, $100K to $500K is 0.4% and clients with over $500K pay 0.35%. The cost of the ETF portfolios we use range from 0.12% up to 0.22% for our core portfolios, and can be up to 0.34% for some of our Socially Responsible Investing (SRI) portfolios. That means the total cost of a ModernAdvisor portfolio at the high end is 0.84%. If the average mutual fund in Canada costs 2.35% per year that means a 1.5% savings per year. Who exactly holds my money? All ModernAdvisor client accounts are held at a well-established and independent custodian, Credential Securities. Credential is a member of the Canadian Investor Protection Fund (CIPF), meaning that client accounts are protected up to $1 million. Credential acts as the custodian for credit unions and portfolio managers across Canada, holding over $25 billion in assets for safekeeping. Unfortunately, we can’t help you files your tax returns, but ModernAdvisor clients receive all the standard contribution slips and trade reports needed to file their income tax returns. We can also help you choose the best type(s) of accounts for your investments if you are unsure. For clients with more than a single account we can also help optimize the asset allocation to help minimize taxes or eliminate foreign withholding taxes where possible. Can investors talk to a real human at any time? Clients can schedule a call on our website, use the online chat, or send us an email. We’re not available 24/7, but close! What else should investors know? Can’t investors just try and invest on their own? In the past I’ve likened DIY investing to “going to an all you can eat buffet every day for every meal”. Sure, you can stay healthy, but if you are anything like me you are likely to make at least a few bad choices. There’s no denying that there are successful DIY investors, but many have a hard time developing and sticking to a plan. What often happens is an investor will either succumb to the flavor of the month they read about in the financial press or hear about on BNN, or they take too much risk and get spooked at the slightest dip in the stock market. Many DIY investors also forget about bonds and go for a 100% equity portfolio, a recipe for disaster if you overestimate your risk tolerance. Quite often, DIY investors put together a sound investment portfolio, but then they get busy with life and simply fail to maintain and rebalance their investments. That can result in a sub-optimal portfolio or too much risk exposure over time. My advice to people who want to do it themselves is to make sure they tune out the noise and stay away from over-trading. At the same time, they should dedicate enough time to adjust and rebalance their portfolios at least once a year. Lastly, how can investors get started? Can they really try out your services for FREE with your money? You can open an account on our website in as little 10 minutes, including signing an account transfer form. 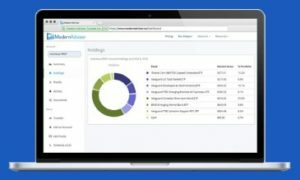 Investors that are unsure if an online advisor is right for them can tryout ModernAdvisor using a trial account. The trial account will allow them to try us out for a month using $1000 of our money. Once the trial is up you can keep the gains on your trial if you open a real account (partnership). We also offer free, no obligation mutual fund fee reports so clients with existing investment portfolios can see how much they could save. Many people are surprised by how quickly even a small percentage savings can quickly compound into serious dollars. Mark – thanks again Navid. I learned quite a bit from your answers and I hope readers did too. It’s great to continue to see the transparency and passion your team has in helping Canadian investors fight high fees and learn how to invest, better and smarter. On that note, I am pleased to announce this offer for readers. Beyond the risk-free trial account funded with $1000 of ModernAdvisor’s you can also get $50,000 managed FREE for one year. 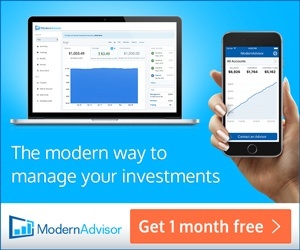 To take advantage of this offer simply open your account with ModernAdvisor using my link. Pretty awesome. Smarter AND better investing choices for Canadians are here. Fight high fees, learn how to invest better and keep more of your hard-earned money working for you. What’s your take on the fintech wave and robo advisors? What other questions might you have for Navid or related robo firms? 23 Responses to "Robo Advisors Demystified"
Not sure why MOA would be promoting a non-MOA type of investing. It’s a pass from me. Nothing says you have to invest this way Lloyd. I offer a range of content on here that may not fit all readers nor investor choices. In running the site, I offer alternatives to my own investing path for people to make their own decision. Heck, I’ve written about trading and penny stocks but I wouldn’t invest that way. True dat. But informing and promoting are not exactly the same thing. IMO. re: …all the algorithms that determine the appropriate asset mix for you based on your goals and constraints are designed by licensed investment professionals. Are these algorithms 100% free from the biases of the licensed investment professionals? Is this brokerage free from ETF revenue-sharing/shelf-space practices? Is it likely that some of our experience and opinions have an impact on the investment framework that we have designed? If I’m being honest I would have to say yes it is possible – after all we are all human and are subject to cognitive and emotional biases at some level. We do try to minimize the impact of any biases in our process by basing following sound research and tried and tested methodology that many institutional investors have been using for many years. We also make sure there is more than one registered portfolio manager involved in designing our investment framework. Peer review and scrutiny is a great way to weed out the biases of a single individual. The great thing about having a rules-based and data-driven investment framework is that once the framework is in place, daily investment decisions are not subject to the opinions and emotions of an individual advisor. But as you pointed out the design of the framework itself could be impacted by the biases of the architects. I cannot say that we are completely immune to that – after all we are all human and are subject to cognitive and emotional biases at some level. What I can say is that we do our best to minimize the impact of any biases in our process by following sound research and tried and tested methodology that many institutional investors have been using for many years. We also make sure there is more than one registered portfolio manager involved in designing our investment framework. Peer review and scrutiny is a great way to weed out the biases of a single individual. As for your second question, we don’t have any revenue sharing arrangements and do not accept any form of compensation for adding products to our shelves. Thanks for the straight forward answers to some important questions. I would suspect like anything in life there are biases SST. I think it would be wrong not to admit that – you have biases no? I’ll let Navid answer this one. I know he reads the articles and comments as well. Cheers. That’s a stretch goal for you then in 2018 = automate that brain! People should learn how to invest their own money. Its hard enough to make – so why hand over and trust others? Mike, many people are not the slightest bit interested in investing and would rather spend the time doing something they want. For them, Roboadvisors are probably the best choice. They are the least expensive of the other options and cover the other important aspects of investing quite well. Thanks for your insights Grant. Always great to hear from you. I certainly feel there is value in robo firms – absolutely so – given far costlier alternatives. From what I see, the best case scenario for everyone is to learn how to invest and become knowledgeable in their investments. It’s your money after all. Why wouldn’t you have any interest in managing your own money? With that being said, not everyone is inclined to learn or willing to learn. For those who are on this boat, it’s best to find an institution to help you achieve your financial goals at the lowest cost possible. For my two cents, regardless if you are investing for yourself or using the service of an advisor, it’s always prudent to educate yourself and invest the time to take care of your financial well being. The greatest return is not how much money that you’ve made in your investment. It’s knowing that you are financially secured and won’t have to worry about money ever again. Totally agree with the education part Leo but I think robos have a place; lower-costs to investors who might otherwise pay far too much in money management fees and the professional counsel as needed. I agree robo advisors hold a valuable place in the investing marketplace and it’s good to have them as an option. People not educated in investing, and/or that have low interest in learning or managing their own affairs could benefit. Probably a better choice than what investors typically do- visit their bank or other advisor offering high fee MF’s and maybe less objectivity. I can think of one person in my household that might fit that category, (if there was no me) but she is very good in MANY other ways. Yep. They don’t have time after texting a few hundred times per day and checking facebook every minute or two! I am suggesting learn how to invest if you have any smarts. If your not willing to learn or as Grant says: have no interest or have better things to do – then knock yourself out and robo away!. In previous articles you have featured ModernAdvisor when discussing “rob-advisors” as a general category. What about a broader discussion comparing the other main “robo-advisors”? I know there are older articles out there that do just that, but is there anything more current? I was going to put together a comparison article for all robos but the Globe and Mail has beaten me to it. For subscribers, they just recently released a very comprehensive comparison guide. I might still pursue that but it’s going to take some major work/research to put it together. Thanks for asking though.